Premium TV manufacturer Bang & Olufsen has unveiled its latest high-quality TV to enter the AV market – the BeoVision 10. 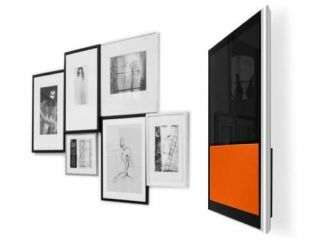 Boasting edge-lit LED backlight technology and an interesting new black glass square frame, the television is the slimmest B&O have released and, according to the company, has been "designed to hang on the wall with your other artwork". Although the TV is pretty thin, with a thickness of 6.4cms, B&O promises it hasn't scrimped on sound quality – a big problem with super-thin TVs – noting that: "despite its ultra slim profile, BeoVision 10 stays loyal to the celebrated Bang & Olufsen tradition for great sounding televisions with high quality speakers and amplifiers built into the cabinet. "We constructed the loudspeaker section with a custom-made bass port solution in the shape of a trumpet to eliminate any turbulent noise." Other specs of the TV are that it has a 200Hz refresh rate; supports Dolby Digital 5.1, DTS 5.1, DTS Digital Surround, Neo:6, Pro-Logic ll audio; and has 2x HDMI inputs. As with most B&O products, you can choose the colour of the frame and the massive designer strip situated on the bottom display, with styles ranging from silver/black to silver/orange. All this does come at a price though, with the Bang & Olufsen BeoVision 10 costing £6,000. It's definitely one for the design conscious then. For more information on the BeoVision, which has a release date of 'coming soon', log on to www.bang-olufsen.com.